Photos at right show area of Shoemake Drive (top) where slide activity has occurred. 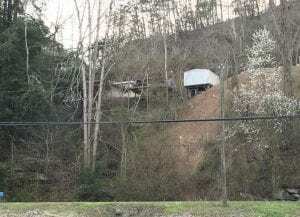 As damages caused by recent heavy rains have become more evident, the Whitesburg City Council has been forced to buy an existing house trailer for just under $20,000 in order to keep it from being pushed down a hill and onto the city’s walking trail. 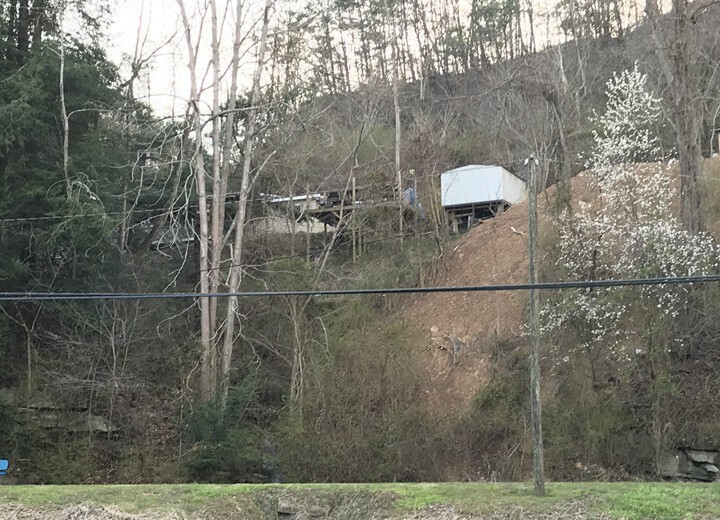 The trailer is currently in danger of being pushed off the hill by a slide that originated on city property above the old L&N Railroad bed near the Fields Cliff residential section. 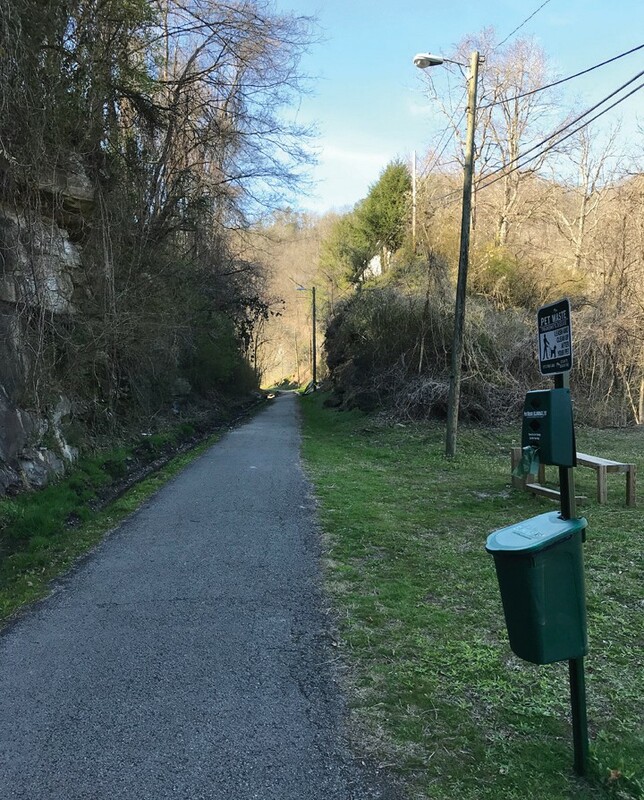 The old railroad bed has been paved over and is now part of popular trail for pedestrians and bicyclists. At the council’s March meeting, following an executive session to discuss the potential purchase of property with city funds, Mayor James Wiley Craft told the council that he is extremely concerned that the trailer, which belongs to Timothy Baker and is located at 72 Shoemake Drive, is in danger of being pushed off the hill. Craft said the trailer sits on property owned by Baker and the city wants to move it to remove the danger. At bottom is the walking trail on the old L&N Railroad bed. Craft said the city will not purchase Baker’s property, but will enter into an agreement with him that will give the city a perpetual easement to enter his property to gain access to the city property where the slip took place. He said that in the event the city-owned property slides again, the city will have legal access to Baker’s property to take care of it. The actual cost of the trailer to the city is $19,995, which is just under the maximum amount of $20,000 that would require the process to be advertised for bidding under state law. Craft said this arrangement will eliminate the danger posed by the trailer if it were to slide and to anyone below it. It also gives the city the ability to address future slides, he said. In other business, the council took the first steps to replace all the city’s water meters with radio-read meters from Mueller Water Products of Atlanta, Ga. The Mueller meters will either connect directly with laptop computers to download information regarding water usage or download it to handheld devices that can later connect to the laptop. A committee composed of Executive Assistant to the Mayor Chris Caudill, Assistant City Clerk Donna Perkins, Councilman John Pellegrini, and City Clerk Jessica Keene that was formed in February to evaluate bids for new radio-read water meters returned with the recommendation that the city accept the $193,558 bid from Consolidated Pipe & Supply Company Inc. of Debord, Ky., to supply the meters. The council voted unanimously to give Mayor James Wiley Craft permission to take the necessary steps to begin negotiations on the contract and the provisions, including maintenance, training, and other important services the company will provide. Craft told the council he wants to be absolutely certain about every aspect of an agreement with Consolidated before entering into a contract. He pointed to a bitter experience the city had in a contract with Veolia Water, which was already in effect when he took office as mayor. Councilman John Pellegrini, a retired surgeon who spoke for the committee, told the council that with 1,250 customers, the city can pay the cost of the meters within five years if it adds $7.90 a month to each water bill. He said this is one way to keep from actually raising water rates, which are among the lowest in surrounding areas. Chris Caudill, who also serves as water maintenance director, said that city workers will be able to handle the installations in about two months. Caudill also said it may be necessary to implement a graduated increase in water rates anyway, in order to qualify for funding to rehabilitate the city water plant and pipelines, which are badly in need of replacement. Pellegrini said his main concern was the possibility that the software for the new meters might not interact with software the city recently bought for city management, including water billing, But Donna Perkins said she had already checked into the matter and the current city software is compatible with the Mueller meters without modifications. Caudill added that the meters come with a 20-year warranty. Pellegrini said that under his plan, the average water bill for a customer who uses 3,000 gallons a month will be $33.90, but most users do not consume that much. The radio read meters will also allow for much more accurate readings. Pellegrini added that the city still has to address a $490,000 deficit in delinquent water bills, saying that most people resent paying for others who don’t pay their bills. Mayor Craft said he will ask representatives of Mueller and Consolidated Pipe to attend next month’s meeting to discuss the provisions of an agreement with the city and to answer the council’s questions. In other business, Jonathon Back, this year’s Master of the Whitesburg Masonic Lodge, asked the council to give permission to expand the Masons’ annual car show to Main Street. Back said the show has been very successful and has outgrown the space in the city parking lot that has been used in previous years. Mayor Craft asked if the Masons have a specific date in mind and they settled on August 4. The council approved the request and Craft said he will contact the Kentucky Department of Transportation to ask permission to close the street on August 4 from 10 a.m. until 4 p.m. The council also accepted a bid from Play Safe Surfacing Inc. for $7,000 to put down the rubber surface for the city’s Sensory Park for autistic children in West Whitesburg. The surface is a two-inch rubber coating that will go over compacted gravel. Donna Perkins said the bid was chosen from four bids to surface the 2,800 square foot park and the surface was recommended by the manufacturer of the playground equipment. Chris Caudill also reported that Perkins has been working on alternatives to save the city money on purchasing water treatment chemicals. He said she had negotiated a clean water agreement with their current provider to supply all the necessary chemicals at a price of $31,000 a year. The agreement will provide the city with new tanks when necessary, and the company will install one new tank to allow for the storage of bulk chlorine. The council voted to enter into the agreement. Paul Nesbitt of Nesbitt Engineering, who works with the city on infrastructure and funding matters, reported that the Kentucky Infrastructure Authority said it has money left over for water projects this year and that Nesbitt Engineering has submitted a funding application. Nesbitt submitted a grant application with the Appalachian Regional Commission as well. Nesbitt also asked the city to participate in the Kentucky Department of Transportation’s Kentucky Utility and Railroad Tracks System, a system that maps roads, railroad tracks, and infrastructure in digital form and makes them accessible on the Internet. The council agreed and Mayor Craft read a resolution designating City Clerk Jessica Keene as the city’s agent for the Kentucky Utilities & Rail Tracking System. Mathew Steen of Nesbitt Engineering will also represent the city. City Police Chief Tyrone Fields told the council the city has the necessary funds in its alcohol beverage fund to purchase a new police cruiser, and asked permission to use the money to buy a new Dodge Durango to be used by the police department. The cost at state pricing is $32,646, and with the additional cost to install light bars and city logo, the total will be $35,000. The council voted unanimously to approve. The council also voted unanimously to appoint retired Letcher County Schools Superintendent Jack M. Burkich and Whitesburg resident Leigh Lewis Blakenbecker to four-year terms on the Whitesburg Housing Authority Board of Directors. Councilman Mike Jackson asked the council to approve setting BikeNite for the second Friday of each month from May through August. The city will close Main Street from 6 p.m. until 9 p.m. for the event and the council voted to approve giving Mayor Craft permission to file a request with the Kentucky DOT to close Main Street for BikeNite.